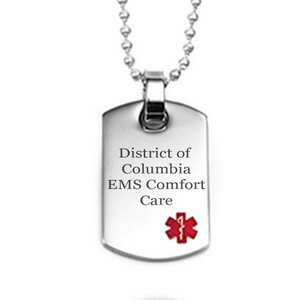 EMS personnel shall recognize only a comfort care bracelet or necklace for purposes of withholding cardiopulmonary resuscitation or advanced life support. The bracelet or necklace shall be easily identifiable and designed so that the following information is visible: (1) The patient's name; (2) The EMS Comfort Care ID number; (3) The name and telephone number of the patient's attending physician. Medical symbol is filled in with red. Made of hypoallergenic 316L surgical stainless steel. Up to 7 lines of 12 characters each, including spaces!